Orange County Rhinoplasty Specialist, Dr. Joseph T. Cruise, Announces the Use of Advanced Visual Aids During Consultations. In order to provide Orange County rhinoplasty patients a more accurate portrayal of what they might expect to look like following surgery, Dr. Joseph T. Cruise has recently developed "The Look I Want". Combining this innovative graphic animation, along with digital morphing, results in higher patient satisfaction. Dr. Joseph T. Cruise has performed hundreds of rhinoplasty surgeries in Orange County, which has enabled him the opportunity to continue perfecting his techniques, not only in surgery, but during the rhinoplasty consultation as well. His awareness and understanding of the complexity of the nose has led him to develop new visual aid methods to use along side of existing technology to better educate his patients during the evaluation process. "Digital morphing and 'The Look I Want' animation allows both the patient and myself to accurately determine what changes are necessary to achieve the desired result," stated Dr. Cruise. 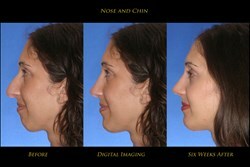 Providing rhinoplasty patients with "The Look I Want" animation and digital morphing allows them to visually see how making one change to the structure of the nose may have an impact on another area. Due to the complexity of the nose, seeing these modifications and variations, helps Dr. Cruise's Orange County rhinoplasty patients more accurately pinpoint the results they want. Providing advanced tools for educating patients is beneficial, and in the end, increases overall patient satisfaction and decreases the need for revision surgery. In some cases, the visual aids could cause the patient to rethink having rhinoplasty surgery all together. Either way, knowledge is power.